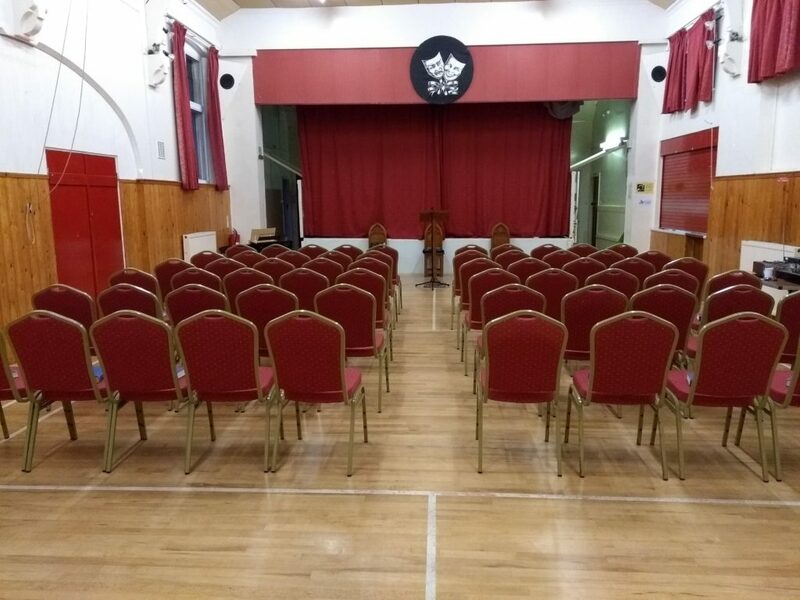 St Andrew’s has an extensive range of well-maintained meeting rooms which are available for use and hire for a variety of functions/purposes. We are a church that seeks to be a welcoming and accessible community meeting space. In our extensive buildings we have many rooms of different shapes and sizes for different activities. 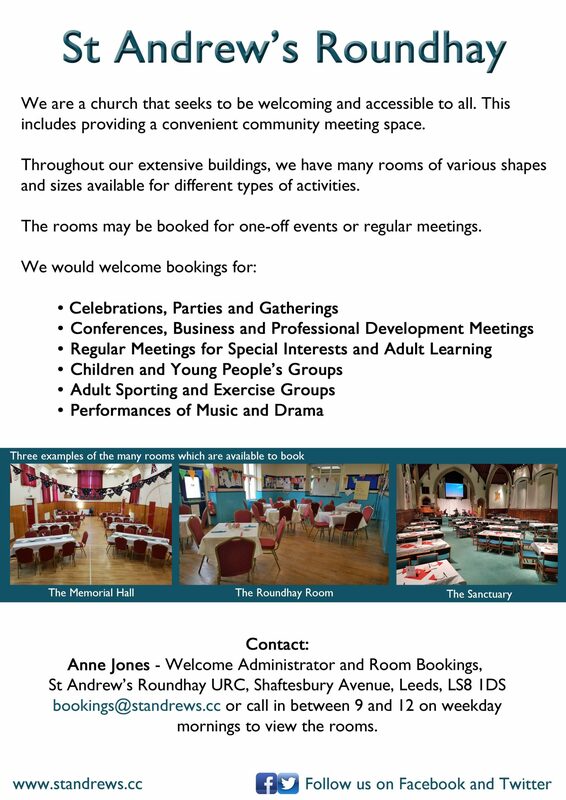 The rooms can be booked for one-off events or regular meetings. We hire the rooms by the hour, the cost depending on the room size and whether your booking is a regular or a one-off booking. Discounts are available (by negotiation) for registered and approved charities. Please contact Anne (above) for further details. The second Saturday of every month neither hall is available as we have a regular family friendly service called ‘Messy church’. There is a short time of worship, games, crafts and a share meal, it’s 3.30pm till 5.30pm, do come along. As we are a church, the Christian festivals of Christmas and Easter are very busy times for us. There is less availability for parties but lots going on for you to join in with. Bouncy castles are allowed in the larger Memorial hall but the bouncy castle must be provided by a professional organisation, such as Mr Shuffles, who have their own insurance and tarpaulin to protect the floor. Both rooms are attached to a kitchen area. For further details see below. This is not a licensed premises for selling alcohol but if you wish to serve wine and beer, please discuss at the time of booking. We have modern male and female toilet facilities together with both a nappy changing toilet and an accessible toilet. This is our largest hall, it is suitable for parties, large gatherings, conferences, performances and playing sport. There is a servery kitchen attached to the hall suitable for simple meals, outside caterers and providing hot and cold drinks to large numbers of people. This is a smaller hall. It is suitable for meals, parties, conferences, arts and crafts, exercise classes and drama. There is a full kitchen attached to this hall, suitable for making meals and providing hot and cold drinks to large numbers of people. Tables can be set up for arts and crafts activities. There is a sink in the adjacent store room for cleaning up paint and other craft activities. This room is a cosy, light room suitable for meetings, adult learning classes and music practice. This is a large upstairs room. This room is suitable for exercise classes such as Pilates, for drama and meetings. It’s got large windows providing natural daylight suitable for art groups. It’s part carpeted and part wooden floor. It has a little kitchenette in the room suitable for making hot drinks and serving snacks. This is the church part of the building. It is a comfortable, warm and attractive space. It is suitable for conferences, performances and meetings. It can also be set up with café style seating. St Andrew’s strives to be an accessible church. The sanctuary has a sloped entrance suitable for wheelchair & buggies to one side and within fully moveable seating enabling wheelchairs to be accommodated alongside regular seats. All downstairs rooms (which make up 90% of our premises) are wheelchair accessible. The sanctuary is equipped with a loop system and we regularly provide large print service sheets and notice sheets. Large print hymn books and Bibles are also available. St Andrew’s has a dedicated toilet for disabled between the sanctuary and hall and wheelchairs available to use on our premises or for loan. Our toilets adjacent to the Hall include an ambulatory unit in the ladies and gents, a dedicated Toddler toilet and baby change facilities. Additional baby change facilities are adjacent to our toilets at the rear of the sanctuary. For specific accessibility enquiries email info@standrews.cc or bookings@standrews.cc.